The Laurel Dollhouse. Featured with 7 other miniature houses to review. 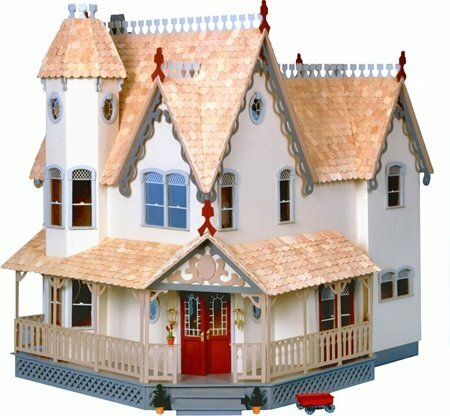 On this page you will find information on 8 Greenleaf dollhouses. Pictures, prices, clickable links, gallery and detailed lists are all provided for your convenience. All items are subject to change without notice. The houses can be purchased at the bottom of each featured item by the link provided. These links will open in a new window. Check out other variable prices by the text link for the best deals offered. Click any picture featured for a larger view. All items list variable prices. Laurel Dollhouse. A quick build design that features elegance and beauty. One you can easily add your own style to. For those wanting to build yet supply some of themselves, this house is for you. 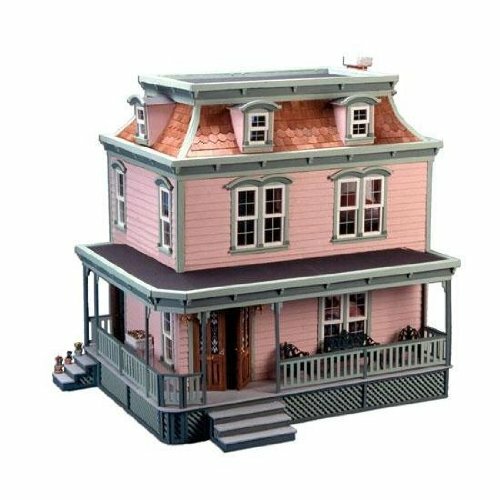 The Laurel Dollhouse is a true gem of a miniature structure - click here for more info. One that you can easily while away some creative moments with your family or friends. Or keep it all to yourself and enjoy every minute. Both in building your own heirloom or for a child who is mature enough to receive it. 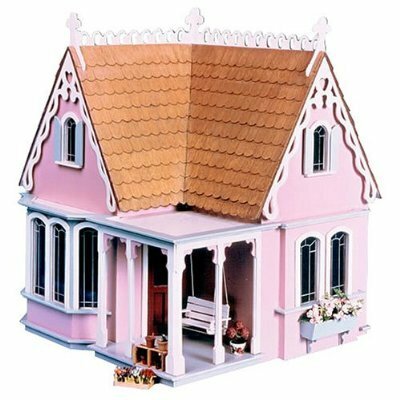 A Candid Review: "I received the laurel dollhouse for Christmas a few days ago. It's almost done (I'm still working on the paint) and really cute. I just have a few complaints...1, the wood is very thin, and should really be thicker. 2, the directions are sometimes VERY hard to understand and may take a good 10-15 minutes before you actually understand what they are talking about. 3, there are no instructions about how to put on shingles, 4, the shingles are very poor quality (i had to buy different ones), and 5, some of the tabs don't match up evenly. Oh yeah, and I might mention, the picture really under-estimates the size. IT'S HUGE." Quote from Amazon regarding the laurel dollhouse. 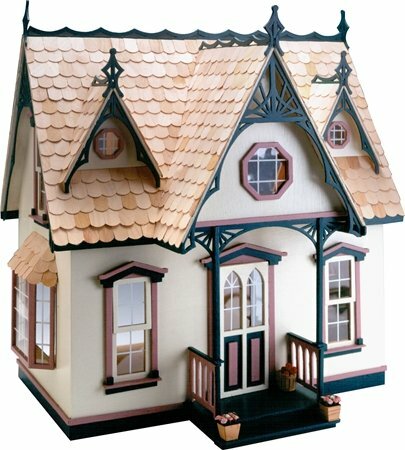 The Laurel Dollhouse is of heirloom quality. They do not recommend you give it to a small child younger than 7. Obviously it is a fancier house than one being designed as a toy. And has age restrictions applied. The Pierce Dollhouse. Another grand miniature in 1:12 scale. One of Greenleaf's most popular selections. Individual apart from the Laurel dollhouse. Its intriguing look is amazing. Captivate yourself with this excellent example in creative design. What an amazing house the Pierce Dollhouse is - click here for more info! Just like the laurel dollhouse above .. When we look at this design we wish we were busy building it today. All the dollhouses we examine create the longing to build them for ourselves. 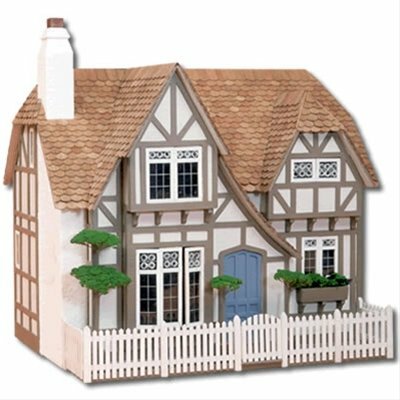 As with the laurel dollhouse above this kit does not come with paint, furnishings, or other decorations. Age recommendations: Assembly - 12 and up. Assembly with parent - 7 and up. Finished houses are not recommended for young children. Lily Dollhouse. A spectacular miniature of creative elegance. Warm up your dollhouse studio and get started. What a fine masterpiece to add to your collection. If you're anything like us, you cannot wait to get started. The Lily Design comes with a lot of stuff - click here for more info. Minus of course the paint and other personal supplies. But is does have shingles and siding. One of the few structures that does contain those accessories. The double doors at the entrance was what did it for us. Amazing really. Definitely a must-have structure. Creative and endearing. 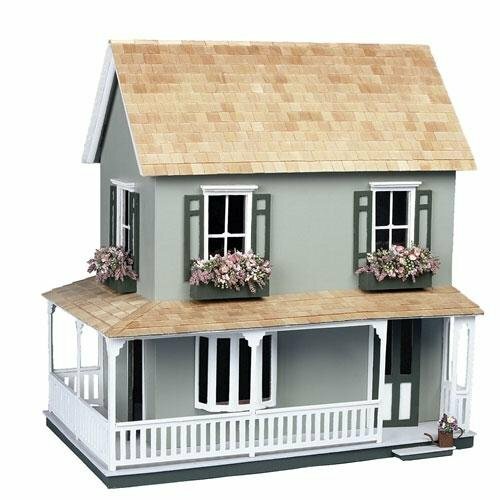 As with the laurel dollhouse this kit does not come with paint, furnishings, or other decorations. Age recommendations: Assembly - 12 and up. Assembly with parent - 7 and up. Finished houses are not recommended for young children. The Fairfield Dollhouse. Could we want for a more sweet design than this? Its tiny scale makes it no bigger than a place mat. Think on that! But think on this as well. If you tend to loose your patience easily maybe tiny half inch scales are not for you. Just a thought. Wow the Fairfield packs a lot of stuff in a small package find all about it here. Those of you who have the patience for this intricate design .. We imagine you can not wait to get started. Always make sure to choose a project that excites you enough to finish. What a waste if it sits untouched because someone did not like what they bought. Magnolia Dollhouse. This is definitely a sweet looking house. We need to make this one. Awesome really. You would love creating this if you had it. So do not wait make your plans to order it today. Something tells us you will not be disappointed. Just get it and see what we mean. 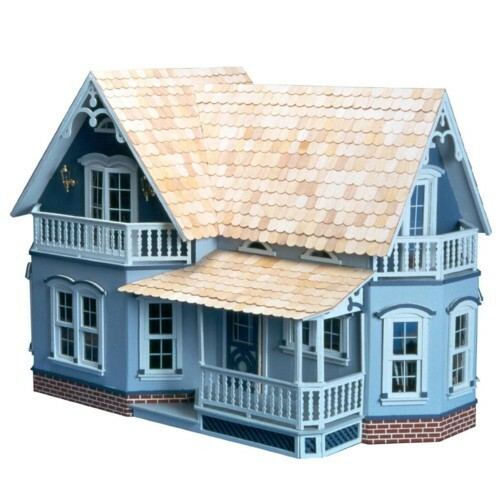 Click here for more info about the Magnolia Dollhouse. When viewing ideas for your next miniature project one has to consider looks. If a house looks creative and inviting enough to pursue .. Then it has something worthwhile investigating. This tiny dwelling has that. The structure itself simply cries, "Build me! Pick me! Amazingly cute it could be on our must build list of the future. Orchid Doll House. Ever desired to go back in time to the Victorian Era? Well with this simple Victorian style mini you can. Buy styles of furniture or come up with your own versions and voila you have traveled back in time. Get dolls that resemble you and your family and there you have it. Project complete. 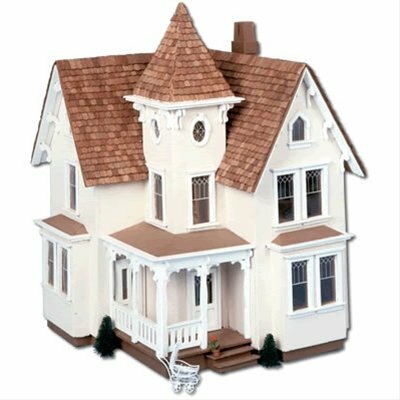 The Orchid Dollhouse is a mini structure that once again can be personalized - click here for more info. In other words it is not set in stone as to how you have to finish. The same building comes unpainted and unfinished on the inside. No wallpaper or paint on any walls. So you get to have all the fun of finishing its style yourself. The Glencroft. This house has been voted a favorite by a number of people. Sometimes we have read reviews where, because of the complex design of the house or the materials used, some have been negative. However this little 1:12 scale house has very positive experiences. While even being complicated to start with. So it would seem... If you give some people a problem they can hardly wait to solve it. Check out all the various awe inspiring details of the Glencroft here. It is a project you can do with your children or grandchildren. One to while away some memorable moments with them. Or just simply go on the journey yourself. Assembling all the finer details. Take this style house to another level and create a totally new look all your own. Use the basic idea and add various dimensions to it. Coventry House. This miniature is endearing and sweet. We just love the cottage look it has. One also, as with the laurel dollhouse, that lends itself nicely to incorporate touches of you into it. Let the sweet tiny swing on the front porch welcome you. Sit for a while and relax. To explore the Coventry Cottage click here. This style mini house has great accessories and imagination. Cute and stylish at the same time. One that we would look to put our own personal touches on. It sports exceptional value in a small package. Think of where this structure would fit in your world. Does it look like you could fashion it to suite in some other area? You bet it would. Greenleaf have a number of ideas for your success. View more selections here. Our final word on the matter: We expect houses, like the laurel dollhouse and others, will simply fuel your desire to create more once you get started. Just like the couple above in a review. They fell in love with making these tiny structures. We encourage you to go on and become better and better at this amazing hobby. If you truly love it .. Why not relax and enjoy the journey?